Seal ring grooves are a critical feature on many oil and gas components, requiring close tolerances and high-quality surface finish. Conventional methods for machining seal ring grooves often result in slow production and poor process security. Multiple-operation approach, incorporating both roughing and finishing sequences, is another challenge. The tools used are single point- or plunging cutters that are prone to vibration. Difficult-to-machine materials, such as solid Inconel 718 and cladded Inconel 625, are often used, only adding to the long list of challenges to overcome. 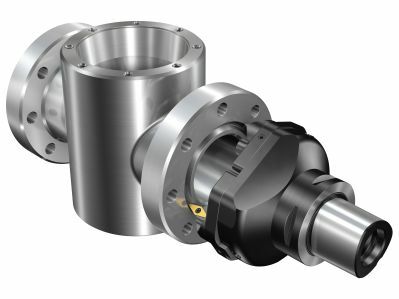 Sandvik's SpiroGrooving™ is a machining method used with the CoroBore® XL system that utilizes a spirograph tool path to create close-tolerance seal ring grooves in a secure and productive way. This solution is ideal for making seal ring grooves in pre-clad machining of steel and stainless steel. The unique internal coolant feature of CoroBore XL enables machining in advanced materials. Roughing and finishing are carried out in the same operation, thereby significantly reducing machining time and improving productivity. Altogether, this solution ensures high output of quality components and process security when machining seal ring grooves. SpiroGrooving uses a circular spirograph tool movement in a taper. This reduces chip thickness, enabling light cutting action and increased feed. Parts of the insert cutting edge have an interrupted cutting behavior, eliminating long chips that can tangle the tool and spindle. With a unique NC-code generator, SpiroGrooving is programmed in just a few easy steps.